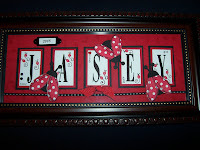 This is the name frame that I made for Brooke and Jason Bell's little girl, Jasey. She should arrive any day now, so even though her baby shower was postponed today due to snowy weather, I went ahead and finished it so it will be ready and waiting for her. Jasey's room has been completely outfitted with a ladybug theme, and I couldn't wait to get started on this project. I love making those little ladybugs out of the Pick A Petal set and circle punches! It was a lot of fun to make, and I hope they will enjoy the piece as much as I enjoyed making it for them!